This was a weekend of changes as Team (Danish Road Racing Team) owner, techniscian and former Team Denmark coach Chris Jensen joined the team to setup the Aprilia RSV4 and coach Michael during the weekend. When Michael and the team arrived to the Portimao circuit they completely changed the settings of the Bike from last year. On top of this, Michael had to fit the new Michelin tires on the "new" Bike for first practise. Alot was different, and the team worked very intense to make the final adjustments of the bike during the free practices on friday. Already in the qualifying practises at saturday, Michael beat his personal best time with more than one second, and qualified 15 for the races on sunday. The weather forecast for sunday promised short showers of rain through the day, and in the warm-up Michael had to fit the wet tyres for the first time in four years. Both races was run on dry track. In race one Michael had a rocket start on his Aprilia RSV4 and was in 7-8th position out of the first corners. In the first laps he had to give up some positions, ending up in a group fighting for 12-16th position. In the end of the race Michael finished 14th but got a little help due to an exclusion of another rider, moving Michael to 13th position. In race two Michael and his team decided to make some changes to the Bike, trying to compensate the missing acceleration and making the Performance of the tires more constant. Unfortunately Michael didnt Benefit from the changes and finished the race in position 18 after a series of riding mistakes and confusion. Overall the weekend was a great succes. Even though Michael and the team needed to do alot of kilometers with the new tires they seemed to do one week of testing in only two hours, and even improving the stability and handling of the bike. 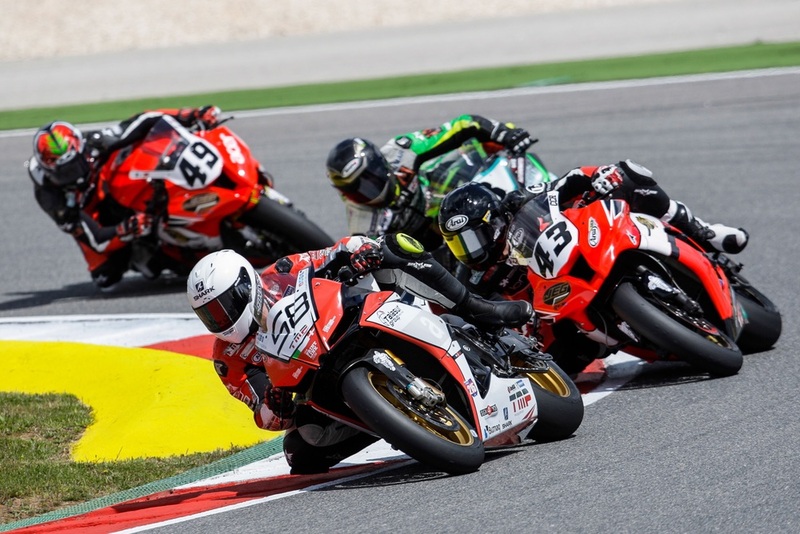 Next race in the FIM CEV European Superbike Championship is in Barcelona 19.-21. Of june.